Feels like it’s been forever since I did a WIAW! You know what that means? I have lots of random food to catch you up on! A sneak peak at a guest post I wrote for Charissa. Coming next week! Red pepper, avocado and fresh mozz omelet for dinner. Froyo! They have PEACH now. Yummmm. Pre-Blend Retreat Airport Breakfast. Worst bagel I’ve ever had. Post-Blend Retreat pretzel. No butter, no salt, still delicious. Yogurt messes…how I missed you. Graeter’s Ice Cream. Strawberry Chip. Summer’s here! Tuna Quinoa Cakes topped with goat cheese. Pre-grocery shopping $1 beer and chips…it’s tradition. Banana with peanut butter. The norm. Why has it been 10 years since your last Clif bar? I don’t typically eat them, but I buy one once in awhile and right now, I’m working on that EXACT bar! I’m totally craving apples right now ‘cept I like them on their own or with PB. 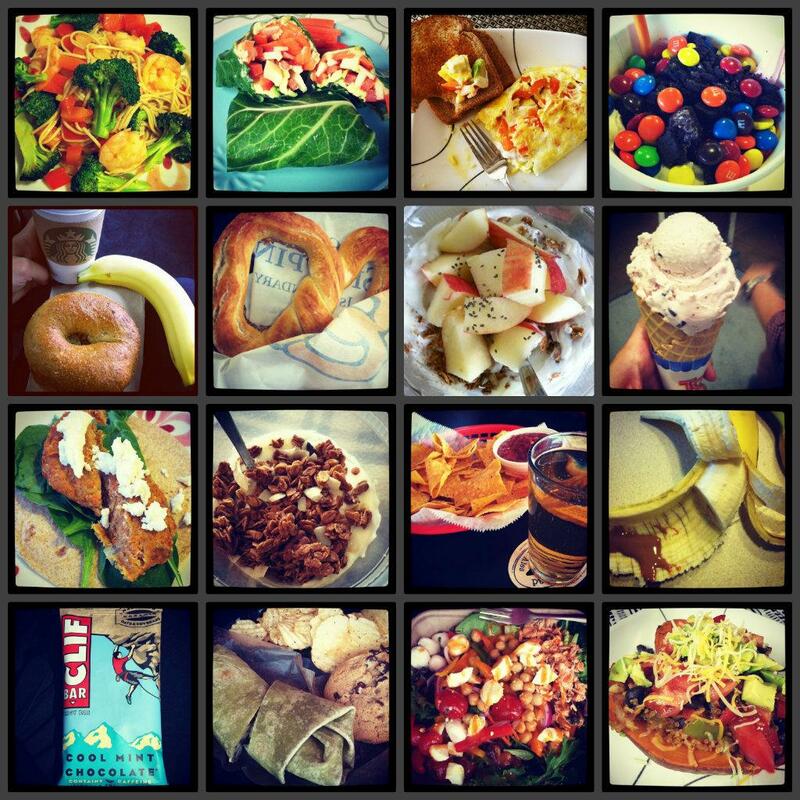 pretty sure i just drooled on my keyboard… all those eats look DELICIOUS! 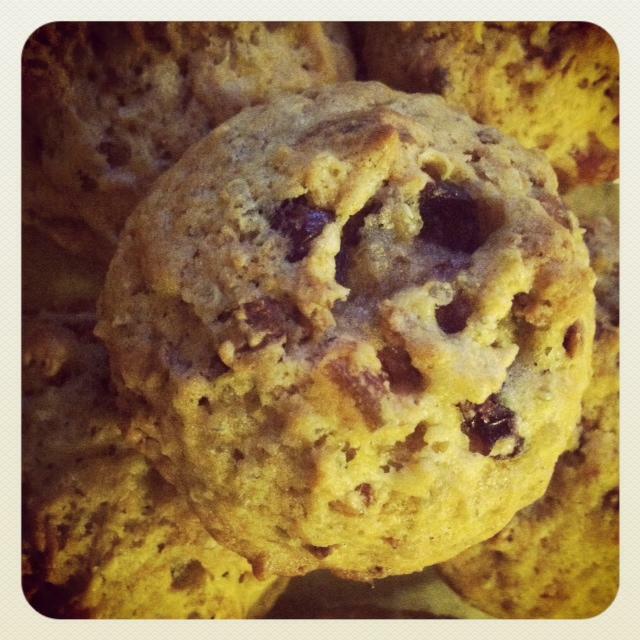 Can’t wait for tropical quinoa cookies, must remember to check back for them! you just reminded me i need collard wraps back in my life!! Wow, you eat some amazing finds. I’m craving that is it lettuce or kale wrap in the second picture? Looks so good. I wish I could eat Cliff Bars. Sadly I’ve yet to try one that I really enjoyed. Ok, now I’m seriously hungry!!! I can’t wait to see your guest post – top row pic 2 looks so interesting! And I also can’t wait for your mexican sweet potato go-to meal. Yay!!!! All of that looks delicious! Can’t wait to see the cookie recipe! I love this idea! Might have to steal next time I remember it’s Wednesday and to do a WIAW. Also, I’m sad because I realized my FPP haul is going to come when I’m in TX over the next few days. The beef has been instructed to open it (JUST in case there is something there that is somewhat perishable) but not to tell me what’s in it. your food always looks SO good!! looking forward to those tropical quinoa cookies! What a yummy bunch of meals and snacks! You really know how to eat well but still with a lot of flavor! Thanks for sharing, Lindsay. Have a great day! I’m looking forward to the new recipe! Um, all my attention is in those cookies at the end. Can’t wait for the recipe. cant wait to see the quinoa cookies! I can’t wait until tomorrow’s post! I haven’t tried soba noodles yet…at least that I know of. I don’t really know why! Thanks for the reminder to try them. Anything covered in that amount of M&Ms looks good to me! I am stoked for that quinoa cookie recipe. I have been meaning to make an alternative grain cookie for a while but am lacking in the mojo…. Oh, wow, cannot WAIT for that Mexican loaded sweet potato recipe! i’ve heard about that graeter’s ice cream… haven’t tried it myself yet! That pretzel looks amazing. Is it Auntie Annes from the mall? Those are the bomb. Yumm can’t wait for the recipe! Hummus wrap also looks amazing! Love the look of those collard wraps! It’s funny that you had the worst bagel ever at the airport during Blend travel. I had the worse veggie burger ever in the Denver airport. Ahh well.